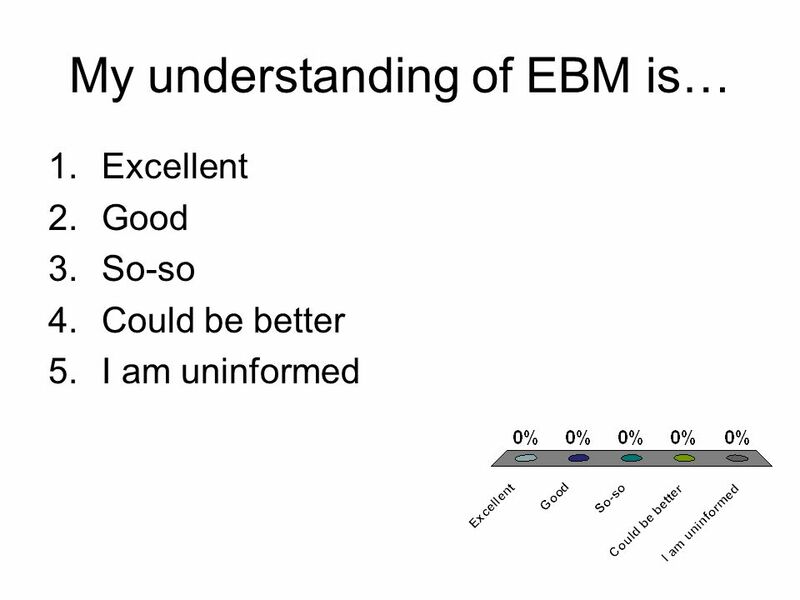 Evidence-Based Medicine For KSOM Y2 Pamela Corley, MLS, AHIP Eileen Eandi, MLS Adrian Follette, MLIS Evans Whitaker, MD, MLIS Norris Medical Library 2003. 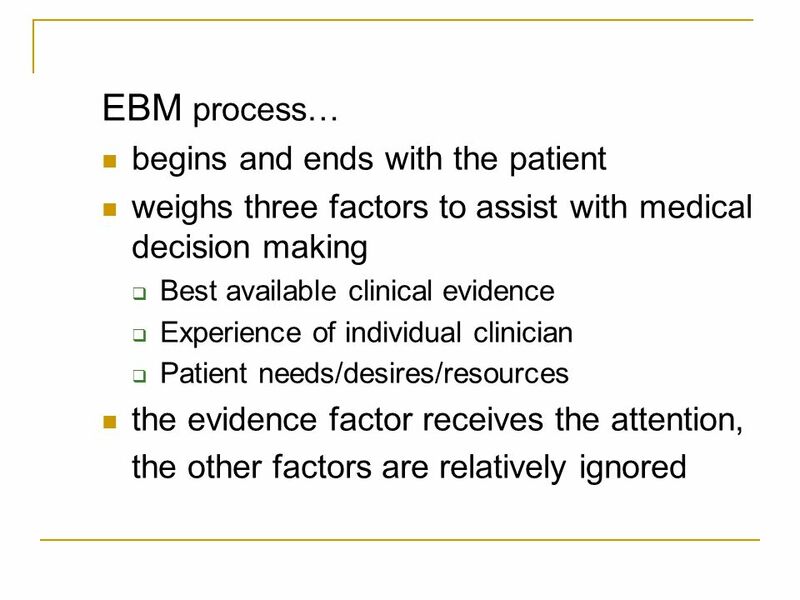 8 What is Evidence Based Medicine? 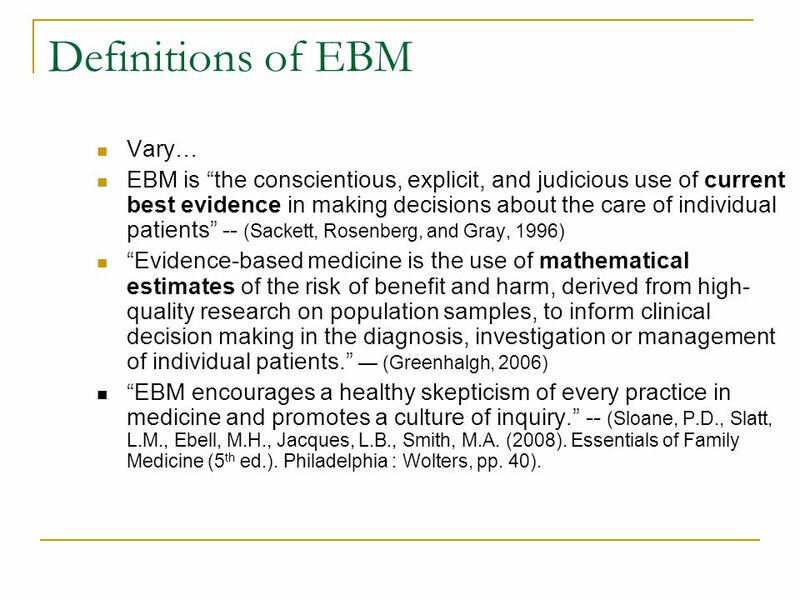 11 Definitions of EBM Vary… EBM is “the conscientious, explicit, and judicious use of current best evidence in making decisions about the care of individual patients” -- (Sackett, Rosenberg, and Gray, 1996) “Evidence-based medicine is the use of mathematical estimates of the risk of benefit and harm, derived from high- quality research on population samples, to inform clinical decision making in the diagnosis, investigation or management of individual patients.” — (Greenhalgh, 2006) “EBM encourages a healthy skepticism of every practice in medicine and promotes a culture of inquiry.” -- (Sloane, P.D., Slatt, L.M., Ebell, M.H., Jacques, L.B., Smith, M.A. (2008). 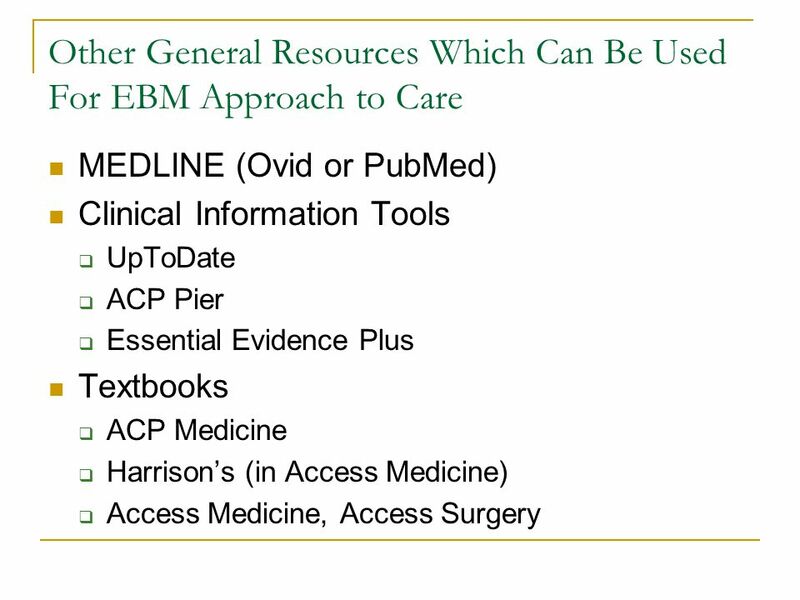 Essentials of Family Medicine (5 th ed.). Philadelphia : Wolters, pp. 40). 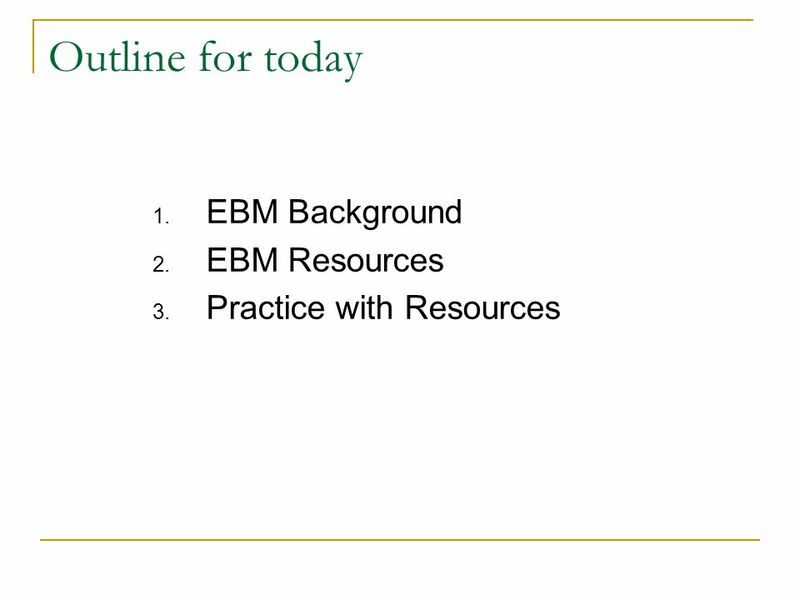 13 Step-by-step EBM 1. 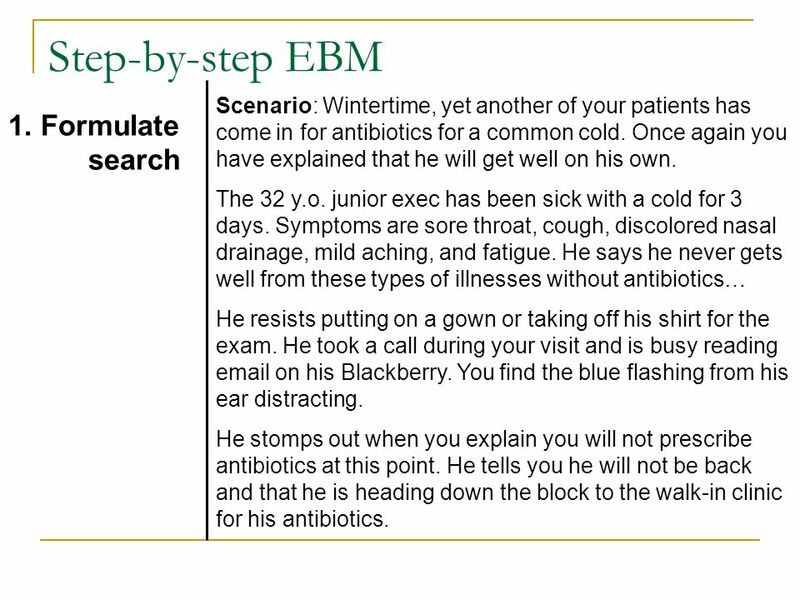 Formulate search Scenario: Wintertime, yet another of your patients has come in for antibiotics for a common cold. Once again you have explained that he will get well on his own. The 32 y.o. junior exec has been sick with a cold for 3 days. Symptoms are sore throat, cough, discolored nasal drainage, mild aching, and fatigue. He says he never gets well from these types of illnesses without antibiotics… He resists putting on a gown or taking off his shirt for the exam. He took a call during your visit and is busy reading email on his Blackberry. You find the blue flashing from his ear distracting. He stomps out when you explain you will not prescribe antibiotics at this point. 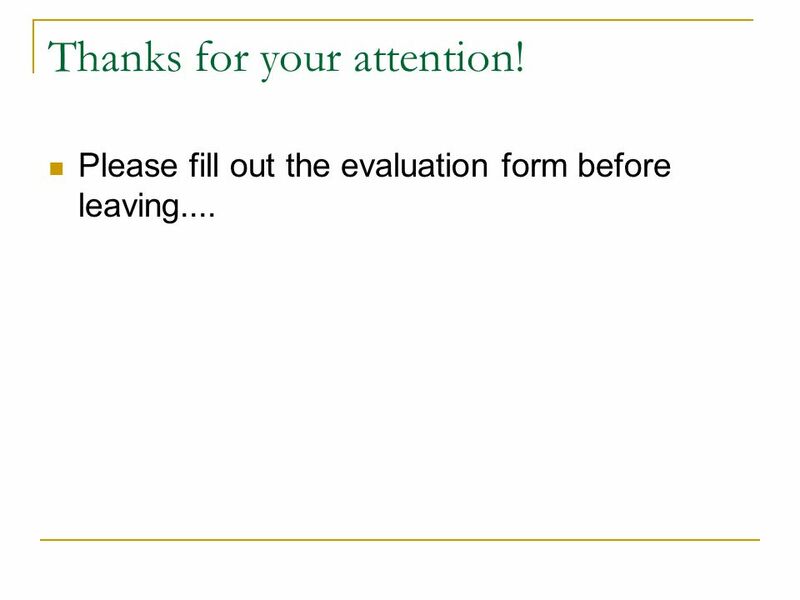 He tells you he will not be back and that he is heading down the block to the walk-in clinic for his antibiotics. 14 What do you do at this point? 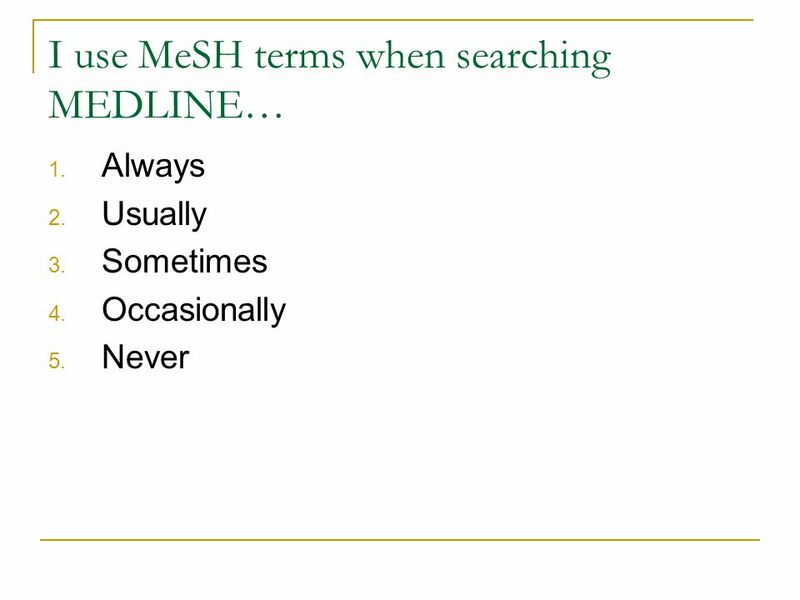 1.Shake it off and see you next patient. 2.Realize he might be right that he only gets well with antibiotics. 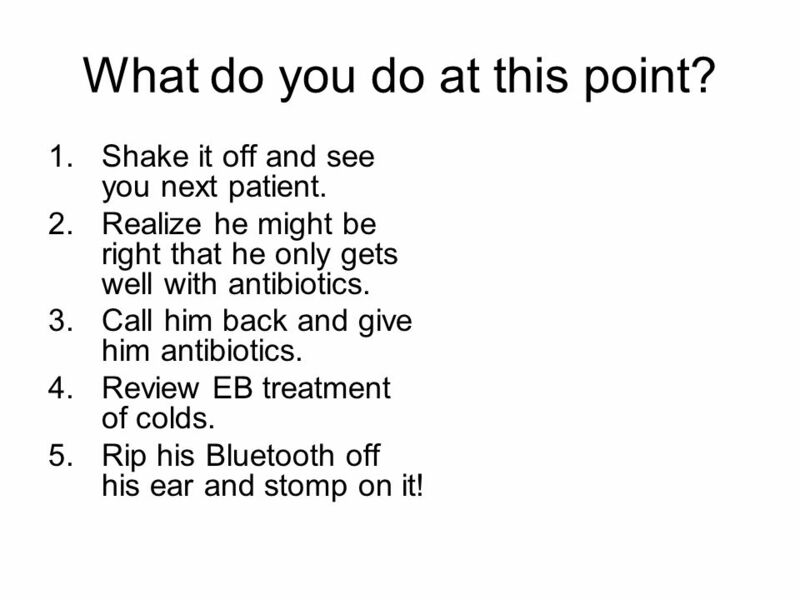 3.Call him back and give him antibiotics. 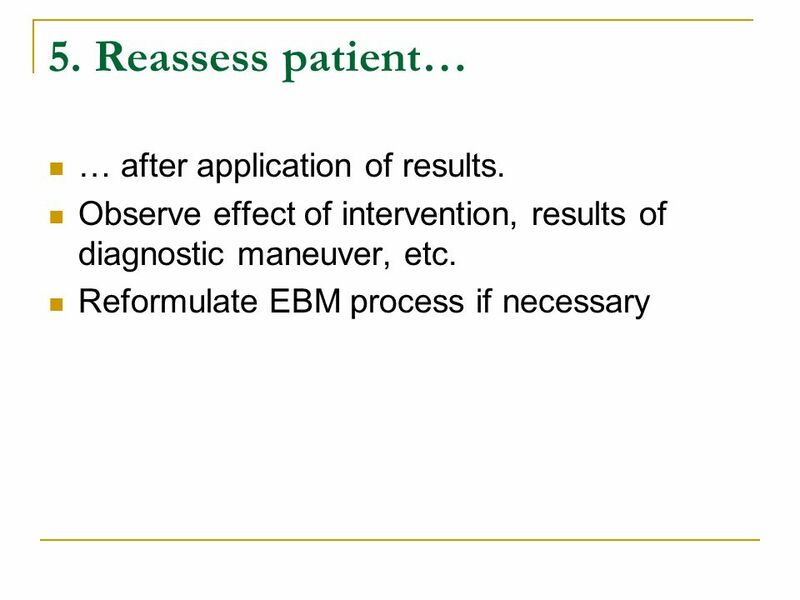 4.Review EB treatment of colds. 5.Rip his Bluetooth off his ear and stomp on it! 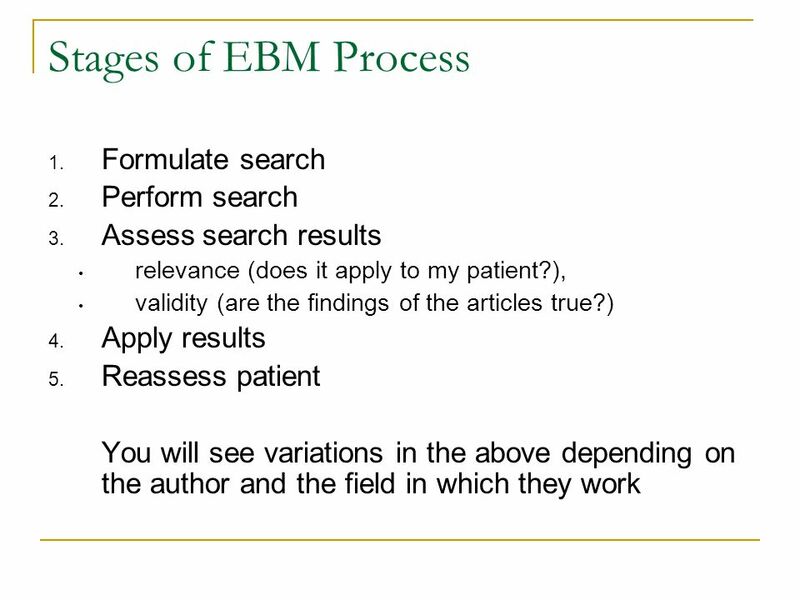 15 Step-by-step EBM 1. 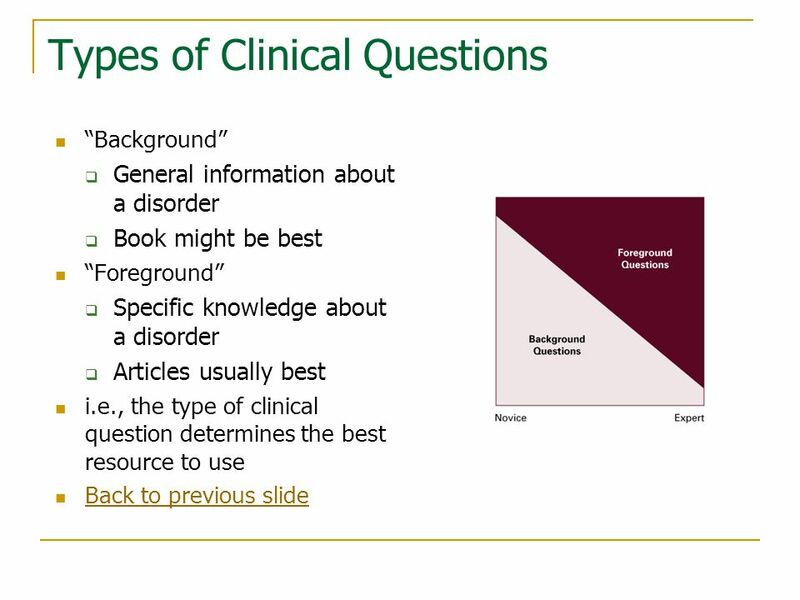 Formulate search (Part 2) Identify information need Define clinical question Define searchable clinical question (SCQ) Identify concepts within SCQ to use as search concepts Identify: Shaken by this hostile encounter, you decide to review the literature of antibiotics for common cold. 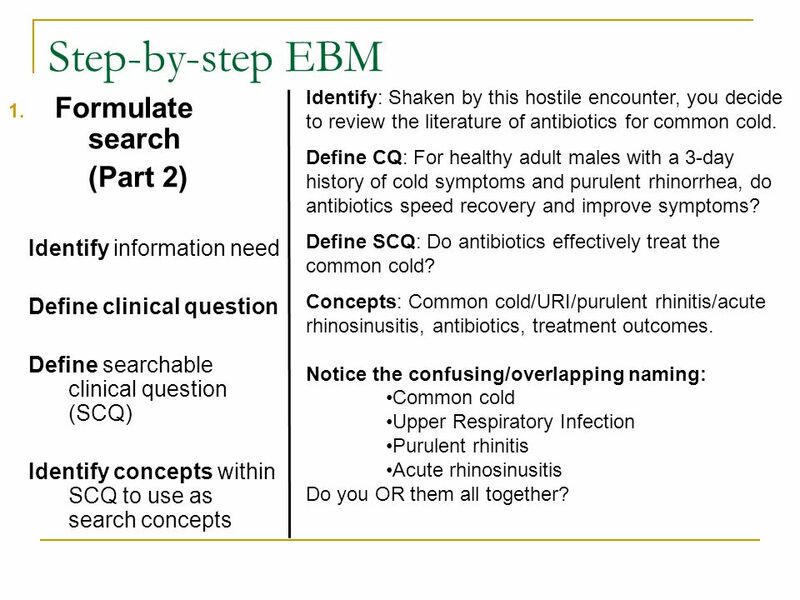 Define CQ: For healthy adult males with a 3-day history of cold symptoms and purulent rhinorrhea, do antibiotics speed recovery and improve symptoms? 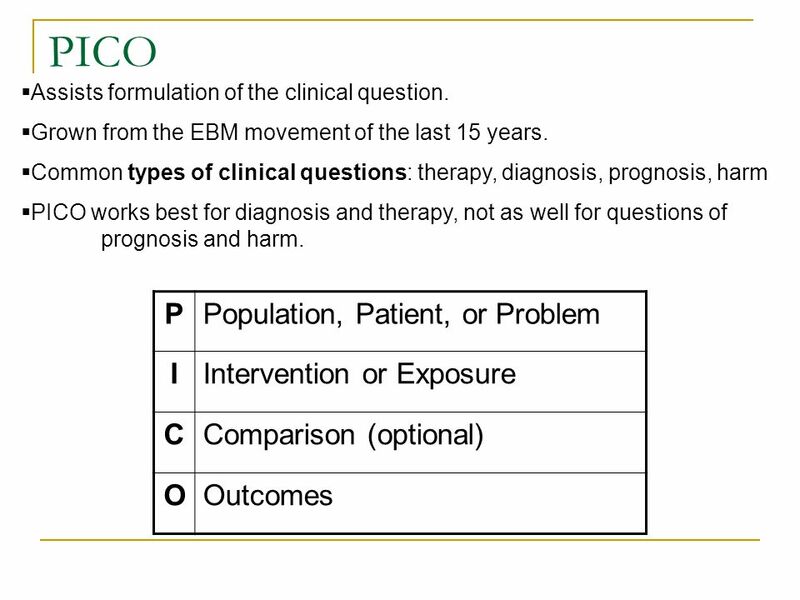 Define SCQ: Do antibiotics effectively treat the common cold? 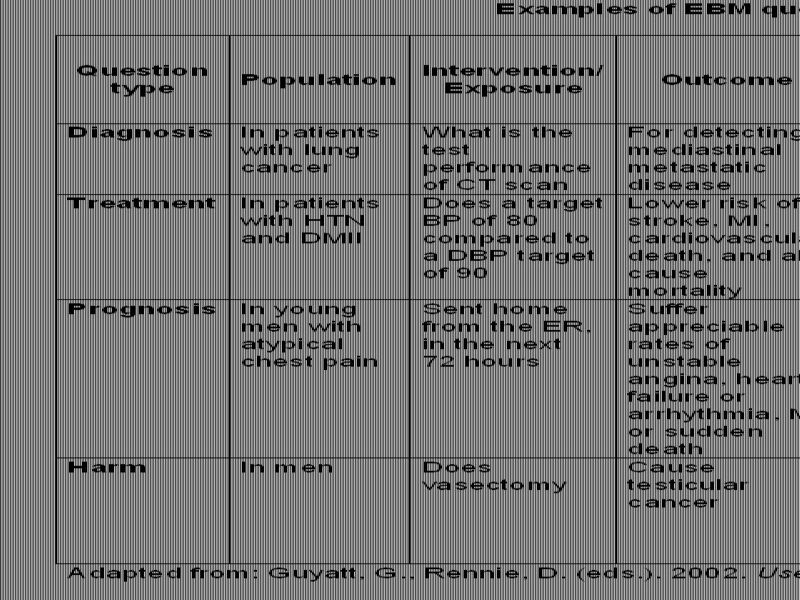 Concepts: Common cold/URI/purulent rhinitis/acute rhinosinusitis, antibiotics, treatment outcomes. 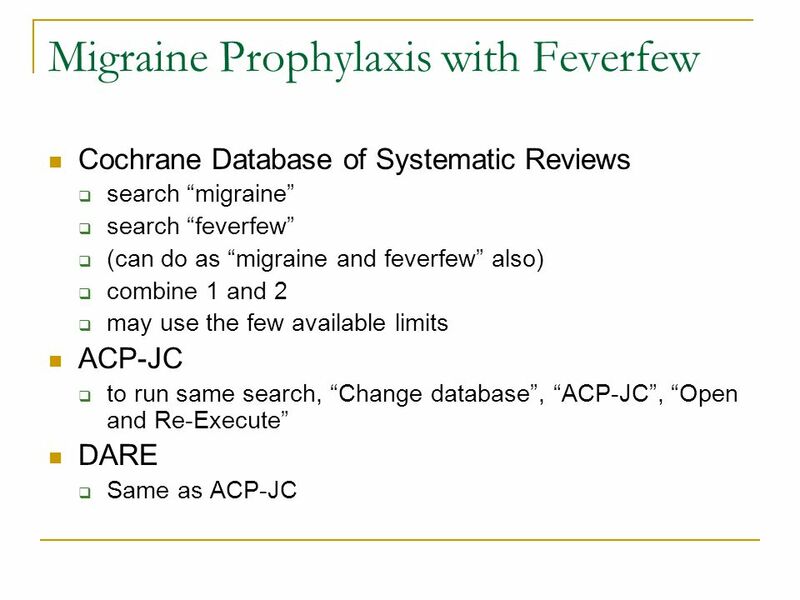 Notice the confusing/overlapping naming: Common cold Upper Respiratory Infection Purulent rhinitis Acute rhinosinusitis Do you OR them all together? 19 4. 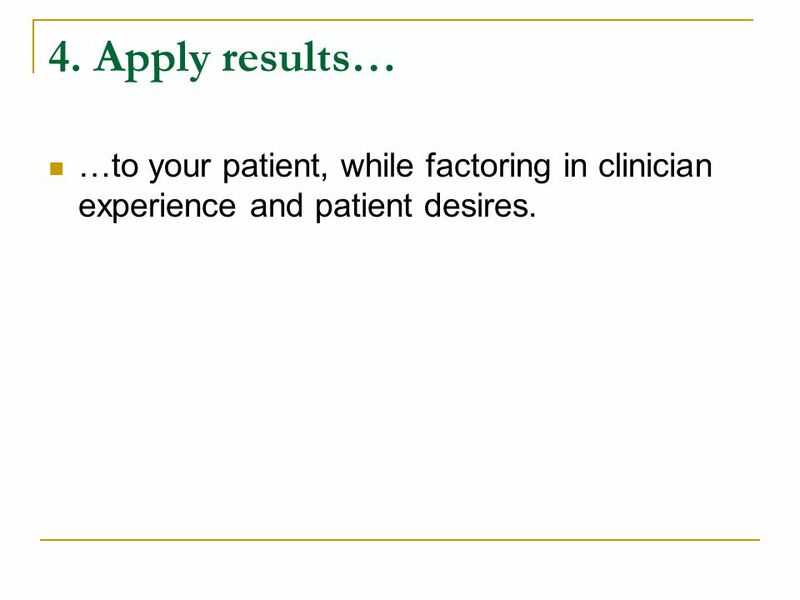 Apply results… …to your patient, while factoring in clinician experience and patient desires. 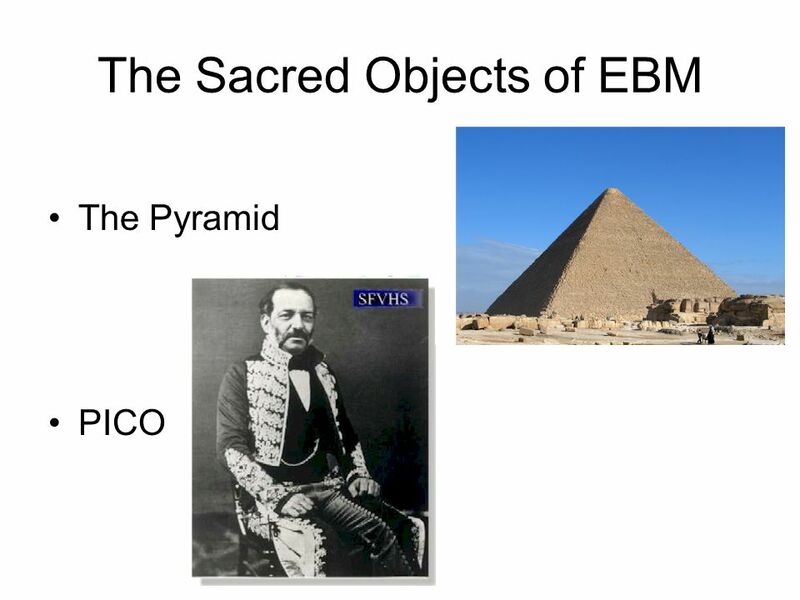 22 Evidence Pyramid Source: http://library.downstate.edu/EBM2/2100.htm The best evidence also is the least available!! 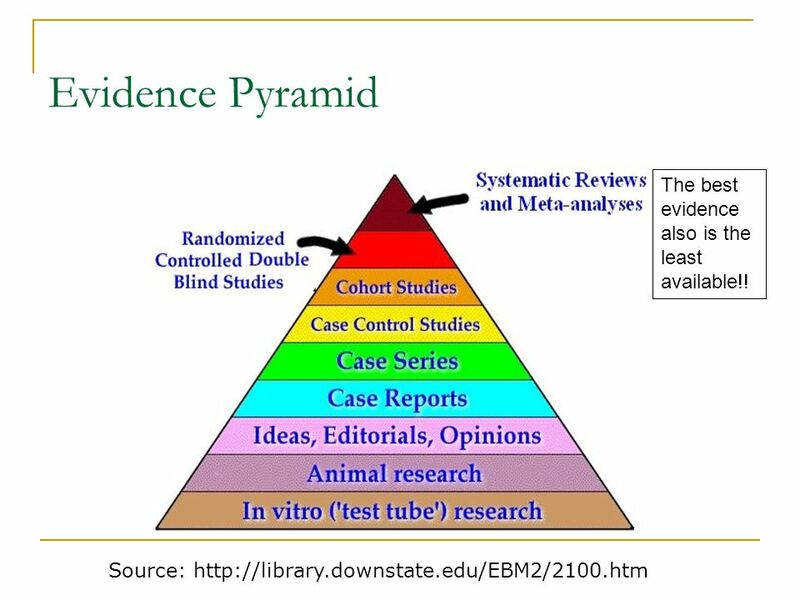 23 Evidence Pyramid Systematic reviews, meta analyses, and randomized control trials minimize researcher bias (see handout). 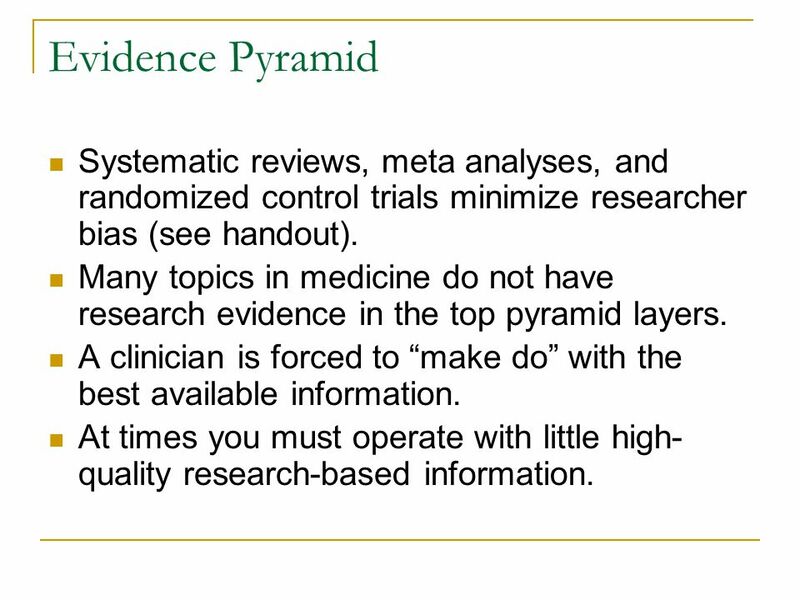 Many topics in medicine do not have research evidence in the top pyramid layers. 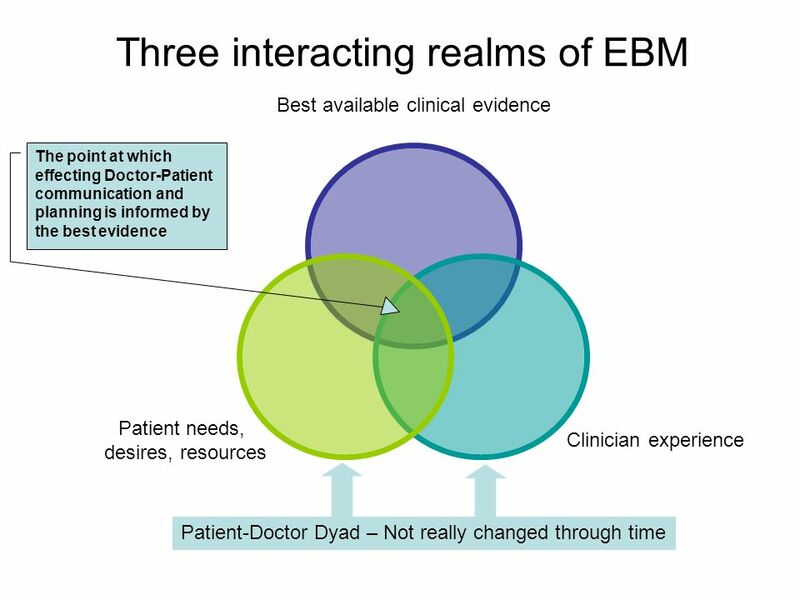 A clinician is forced to “make do” with the best available information. 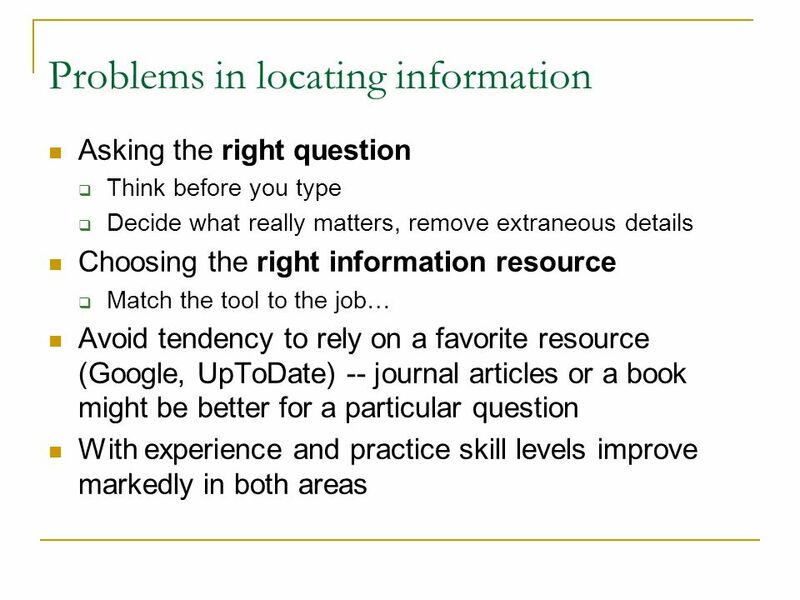 At times you must operate with little high- quality research-based information. 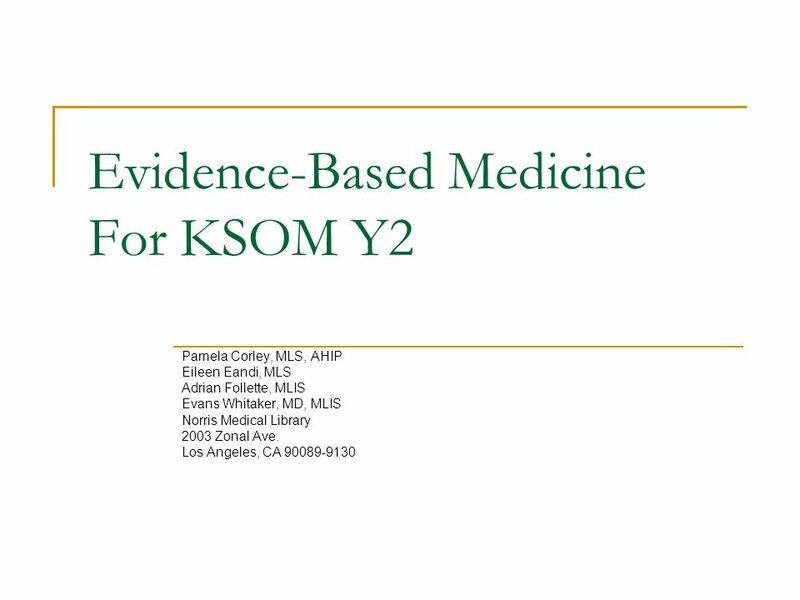 Download ppt "Evidence-Based Medicine For KSOM Y2 Pamela Corley, MLS, AHIP Eileen Eandi, MLS Adrian Follette, MLIS Evans Whitaker, MD, MLIS Norris Medical Library 2003." 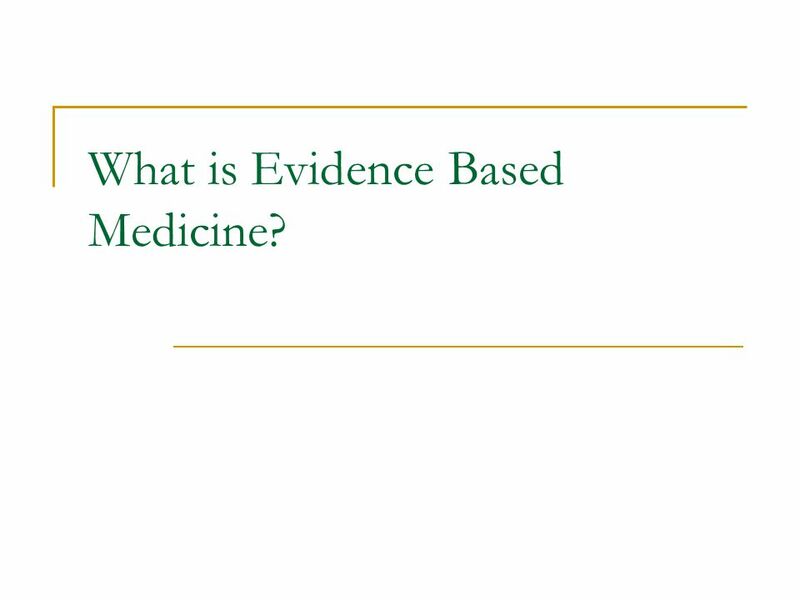 Evidence-Based Medicine Introduction Department of Medicine - Residency Training Program Tuesdays, 9:30 a.m. - 12:00 p.m. - UW Health Sciences Library. 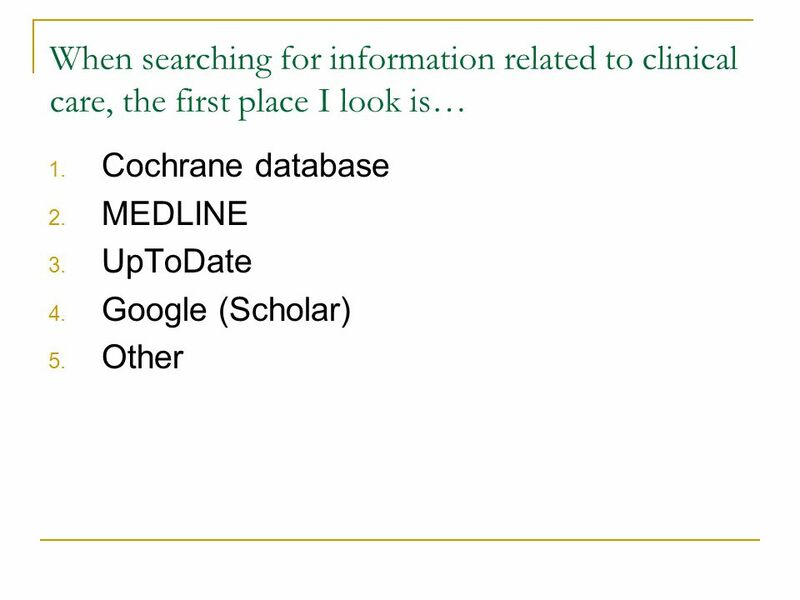 Information Pyramid UpToDate, Dynamed, FIRSTConsult, ACP PIER ACP Journal Club Cochrane and other Systematic Reviews (OVID EBMR) MEDLINE Searches with. 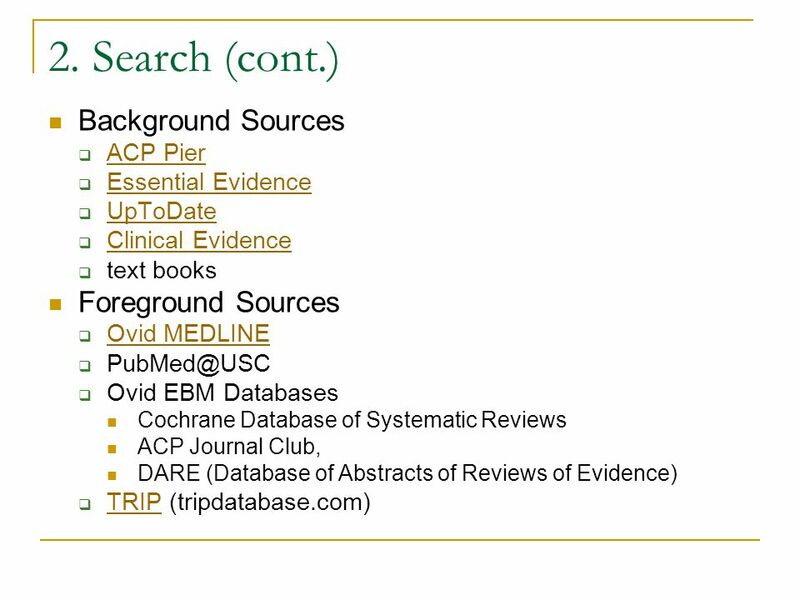 Efficient Searching of the Literature & Critical Appraisal Rick Wallace March 9, 2007. 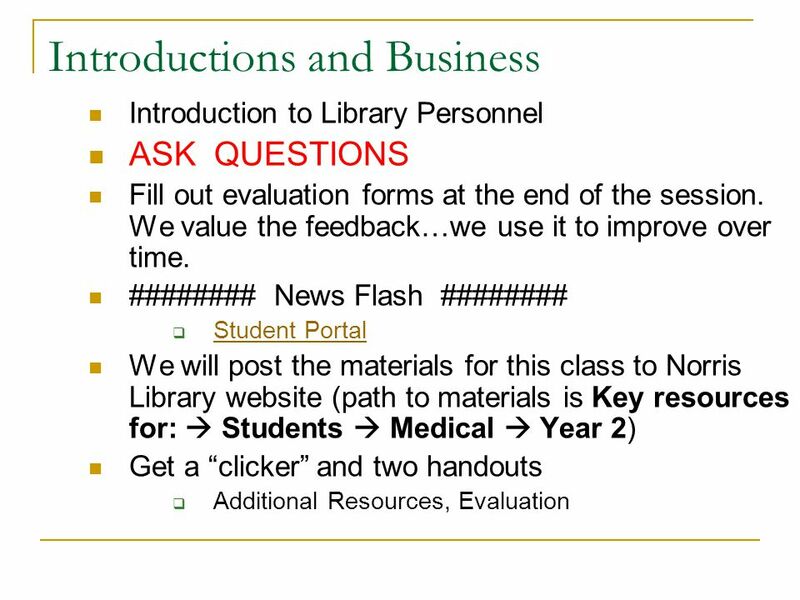 Revised January 2008 IUPUI University Library Randi L. Stocker, MLS developed for the Indiana University School of Nursing. 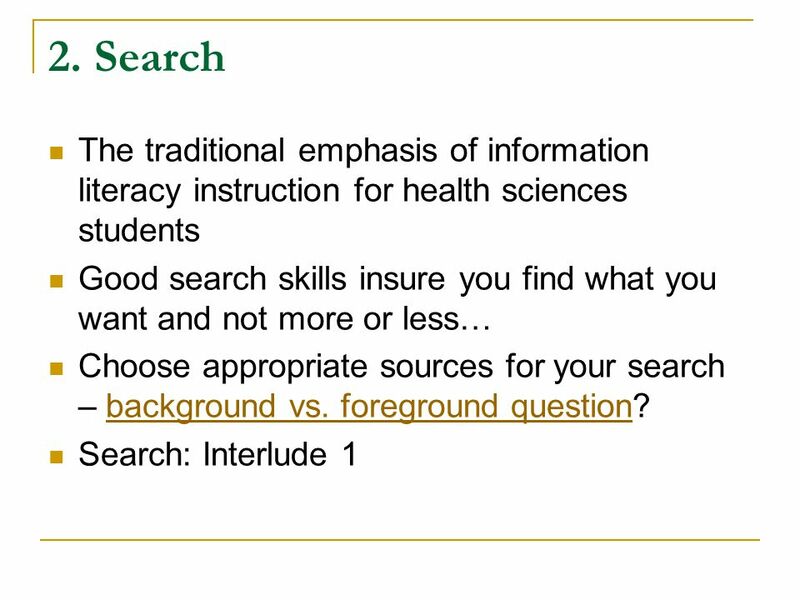 Session 2: Finding Medical Information in a Clinical Context Leilani St. Anna, MLIS, AHIP Information Management Librarian, Health Sciences Library healthlinks.washington.edu/hsl/liaisons/stanna. 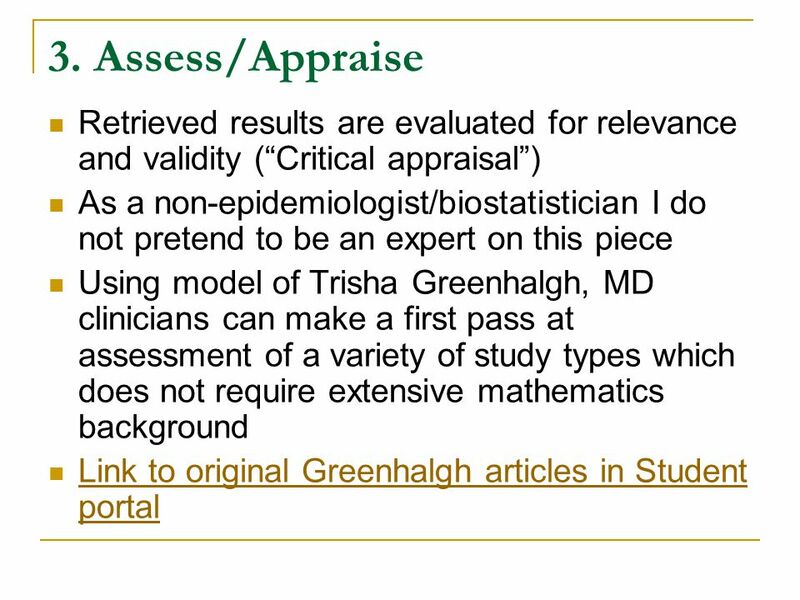 Find the Evidence! Sean Elliott, MD Annabel Nunez, MLIS. 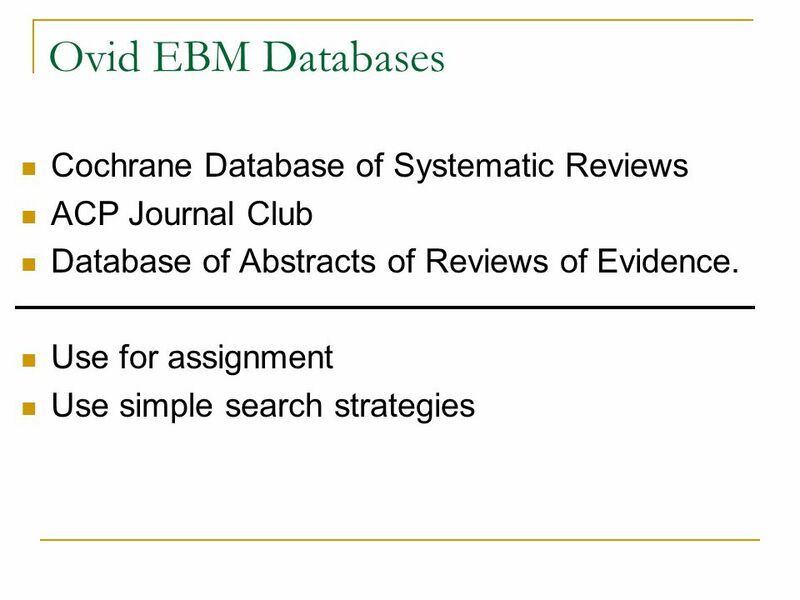 Chapter 3 The Quest for Evidence: Getting Started. 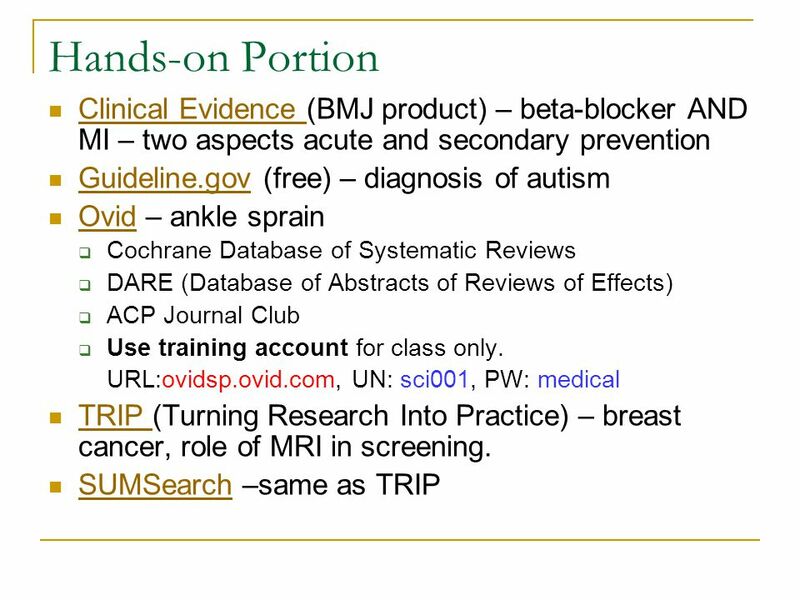 Finding Evidence to Support Physical Therapy Clinical Practice: DPT. 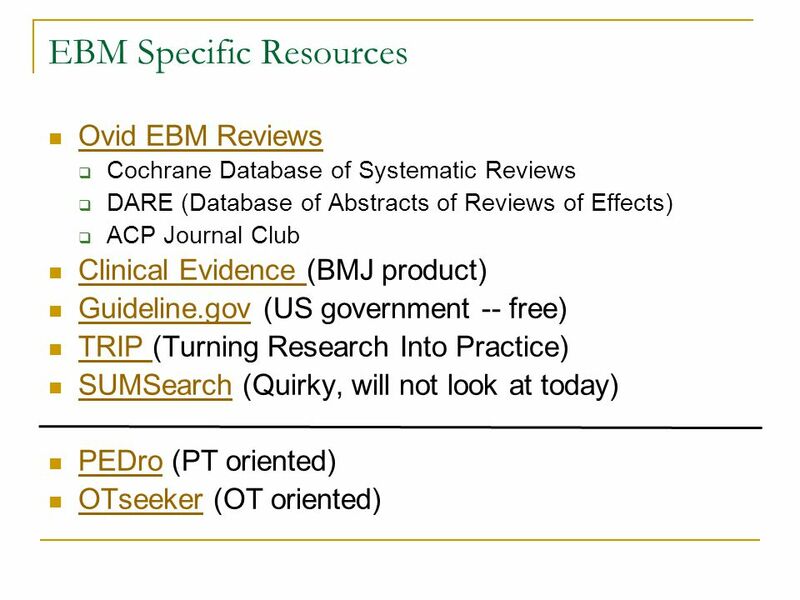 Finding the Best Evidence Literature for Evidence Based Health Care. 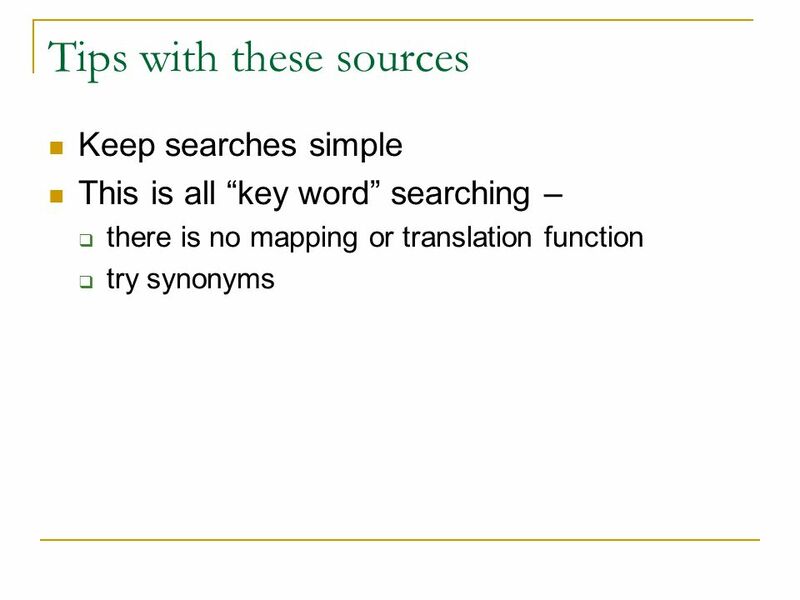 An Introduction to Evidence Based Searching Kerry Sullivan, MLIS Health Sciences Librarian November 2010. 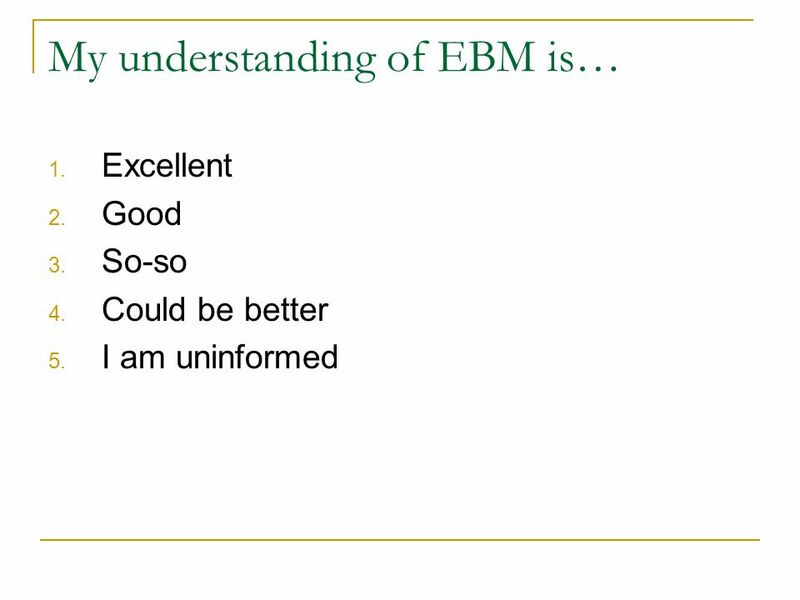 Introduction to Evidence Based Medicine Pediatric Clerkship LSUHSC. 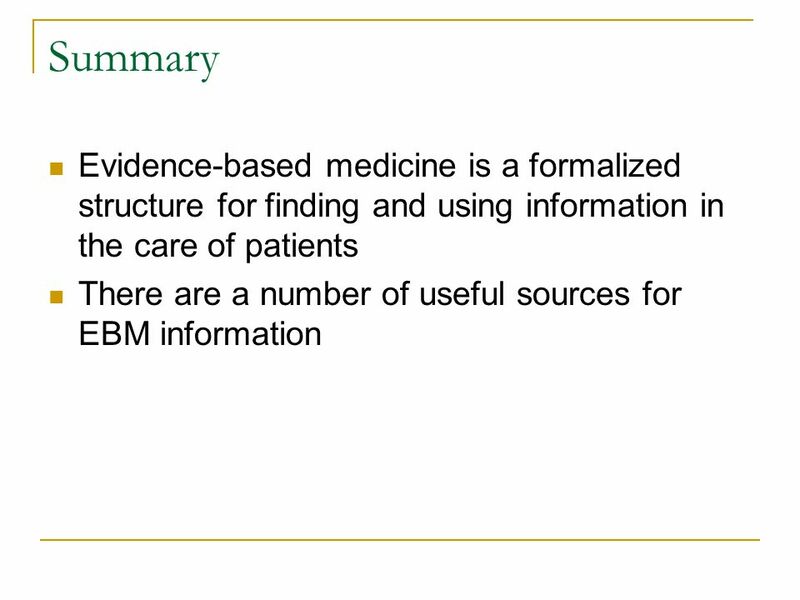 1 Medical Literature as a Resource for Evidence-Based Medicine. An Overview. Jarmila Potomková Palacky University Medical Library. 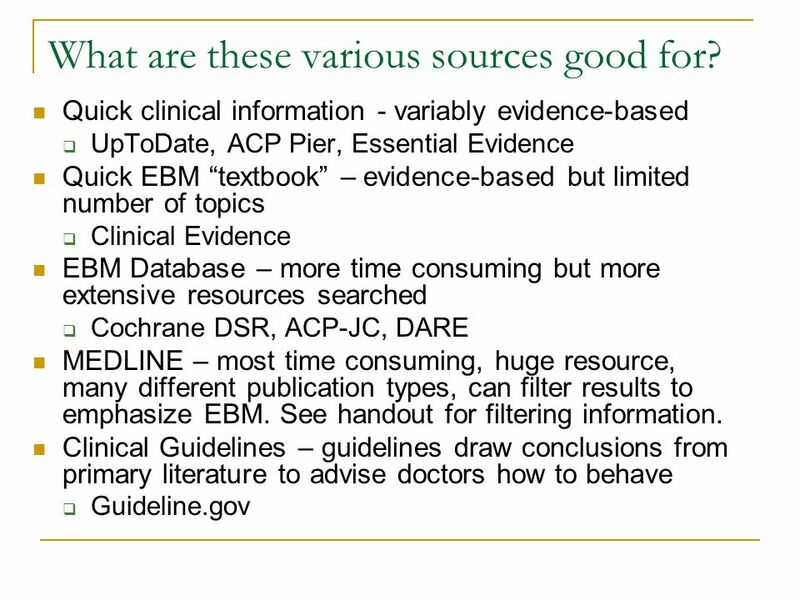 Sources of Clinical Effectiveness Information & Finding the Evidence Presenter Contact details.